Mosaic tile has been used for thousands of years. 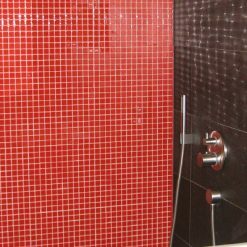 Mosaic design is based on the concept of creating an larger image or design from smaller, component pieces to produce a striking new concept. 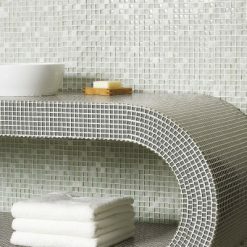 Our comprehensive mosaic tile ranges come in numerous sizes and textures which can form a great springboard to stimulate the design process. For over four thousand years, the art form of mosaic tiles has developed. Originating in ancient Mesopotamia, the cradle of civilisation, the earliest "mosaic tile" was actually assembled bits of distinctive, coloured stones, glass and other materials. Mosaic tile also came in a form that used terracotta cones, the points of these cones were pushed into clay to produce a decorative surface. The ancient Greeks were quite resourceful too, using pebbles to create "mosaic" decorations. Glazed mosaic tile made its first appearance in Susa, or modern day Iran, around 1500 BC. Form there, mosaics spread into Macedonia, the to Carthage, then Rome. Mosaic tile really reached it's greatest ancient expression with the Roman Empire, particularly in wealthy provinces of Africa and Syria. Archeologists have also unearthed stunning mosaic tile floors in Herculaneum and Pompeii. The mosaics in the Roman Empire featured everyday scenes, geometric designs and depictions of their pantheon of gods. The poorest quality mosaics in the entire Roman Empire are to be found in Britain! Perhaps this is due in part to the fact that few mosaic artists were to be found at the wild reaches at outer edges of the empire! Following Roman times, the Byzantine Empire also made extensive use of mosaic tile. There are many distinctive features of Byzantine mosaics. They were mostly ungrouted, in order to allow light to reflect off of all of the edges. Also, the "smalti" tiles were set at a slight angle in order to catch the light reflections from different angles. This resulted in sparkling mosaics no matter what view they were seen by viewers. In the fifth century, the city of Ravenna became known as the city of mosaics. The most widely known building in Ravenna is the mausoleum of Theodoric, who was a king of Byzantium. Soon after this period, the Islamic world continued the story of mosaics, focussing on depictions of geometric figures and mathematical principals. Islamic mosaics often were produced according to a special technique which was called “zillij”. 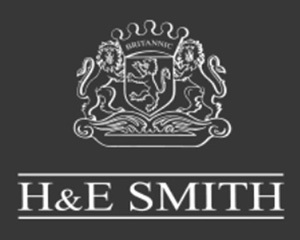 The Zillij technique involves creating specific tiles for the particular project, then further working by hand on each tile in order to ensure a custom fit that covers the entire surface in a seamless piece with no gaps. 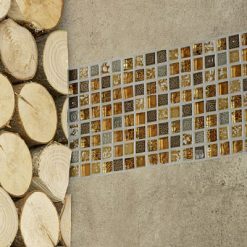 Mosaics have come a very long way from their Mesopotamian inception, with a rich and varied history. 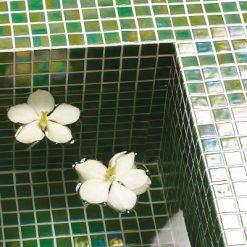 Today we use art glass, stones and glazed mosaic tiles to bring a design to life. 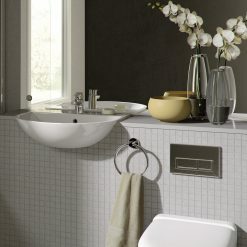 With so many new products now available, mosaic tile has a great future ahead of them!